In World War II, the Nazis made a bunch of different booby trapped items, including thermos flasks, mess tins, motor oil cans, watches, and even a chocolate bar designed to kill Winston Churchill when he bit into it. 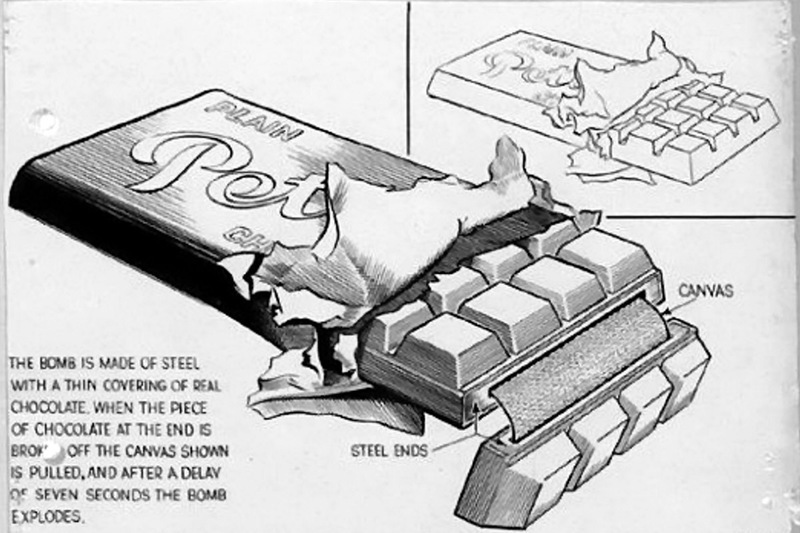 Fortunately, England's Prime Minister did not sink his teeth into the candy-coated bomb, and the MI5 hired an artist to illustrate it and the other German booby traps it had discovered. These drawings were lost in a drawer for 70 years, but were recently found and have been published by the BBC. The idea was that the drawings would serve as a kind of manual for anyone who had to defuse similar devices. And there were plenty of them. The historian Nigel West, who has written several books on espionage, says: "The Germans during the Second World War were very keen on destroying ships and their cargoes leaving neutral ports for the United Kingdom. "The idea was to starve Britain into submission. And they created some very ingenious devices which could be smuggled aboard ships and placed in the cargo holds with long-term timers: they wanted the ships to catch fire or to sink whilst out at sea."